Yeah, I'm not so happy with my Internet Presence these days. Still kinda working out some ideas/kinks/whatnot. Totally open to suggestions, if you have any. 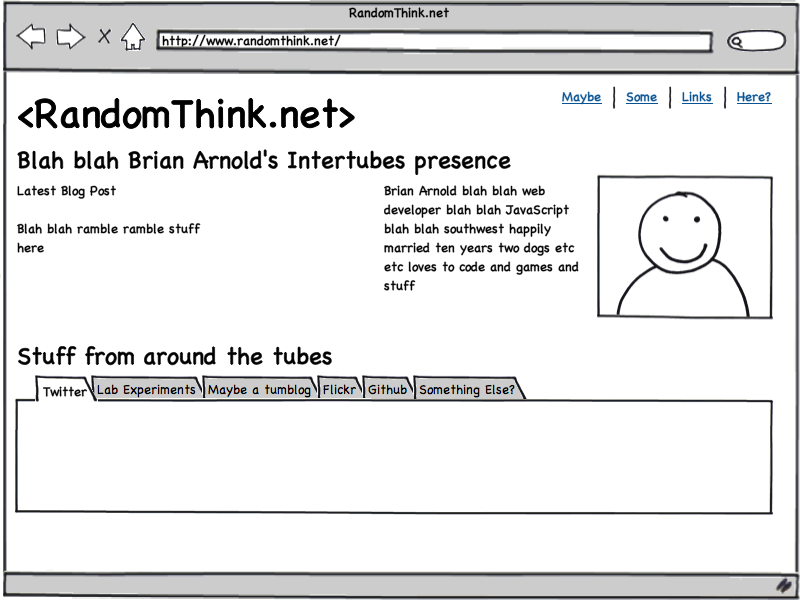 The mockup above is about 37.5% serious - except the Comic Sans use, that's just Balsamiq in action. Save me from myself. Anyhow, here's a few places you can find me, where I am active in varying degrees. Also, typically, anywhere that a username is involved, I'm brianarn - except YouTube, someone beat me there, and AIM (had it, but had to give it up when I quit working for AOL), but that's about it. Anyhow, links ahead. @brianarn on Twitter - honestly, probably the easiest way to reach me, though that username at Gmail also works - y'know, if you like old school email and such. My personal blog, which has been stagnant for awhile now. Really want to change that. Struggling with personal vs. professional talk there. I'm open to thoughts. Color Scheme Designer, with a template I'm considering for this site. The root blue is what you see as the background here. That link is set to complement, though I'm also considering triad. I've been trying to hang out on freenode more lately - typically in #dojo and a few other rooms. My username there is brianarn, but if you've read this far you likely knew that. So, there's that. Kind of a sampling of me. Knowing me, this will likely be my home page for at least several months, but at least you can get the gist of me through it.